During some recent games I noticed some odd positioning of free kicks in the attacking third. As we have been saying all along, it is important that referees be in the right position, have the best angle to view and be ready for the next stage of play. We have also been saying that the referee needs to be “looking” at players and “not through” them. In the illustration above, the referee with the X through it is what I witnessed recently. This position was used decades ago and we must move in the direction of the current positioning. By using the poor position above, the referee cannot see all the players, is not able to see his AR, is limited to where he can move and does not have an angle to view. The proper position in where the referee is without the X. 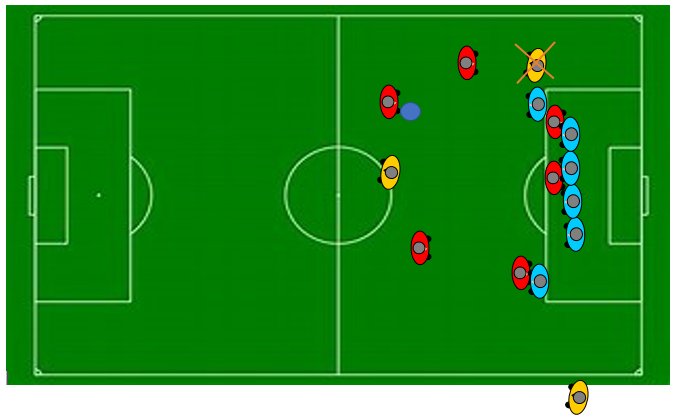 The referee is looking at players, can move in any direction if needed and observe the flight of the ball. He also has the AR in view. This correct position does not change drastically if the FK is on the opposite side of where it is now.